Happy Valentine's Day! I hope you get to spend it with someone you love. Or at least a good bottle of wine (or beer...that would be my choice). 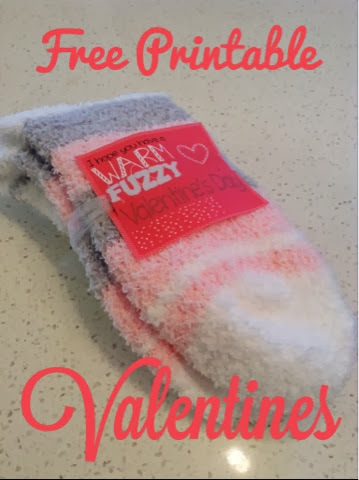 When I posted our valentines from last year on Pinterest, some very clever person commented that the tags would be cute with some fuzzy socks. And, by golly, they are! 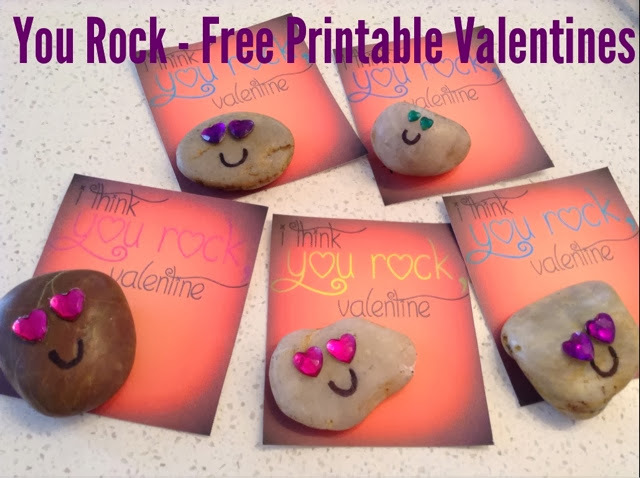 Talk about a quick and easy last-minute valentine gift. To get the free printable file, click here. That brings us to Little Spaghetti's valentines from this year. He wanted to give away something with a face after last year's warm fuzzies. 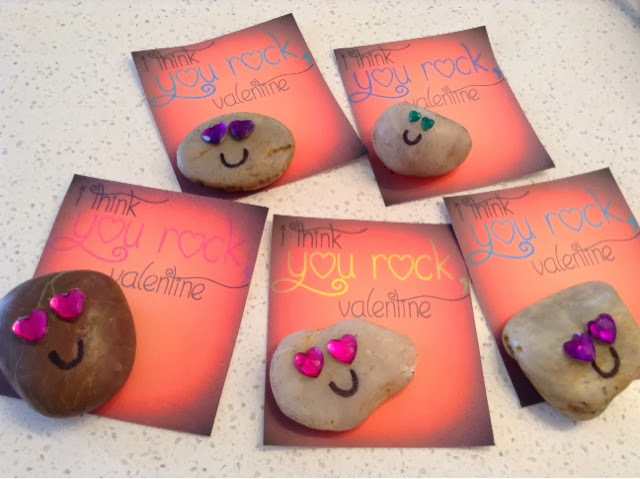 So, we made pet rocks. They are fun and easy, and all his little friends loved them as much as he loved giving them out. Hot glue - apparently - does not stick to rocks. At least not my rocks. 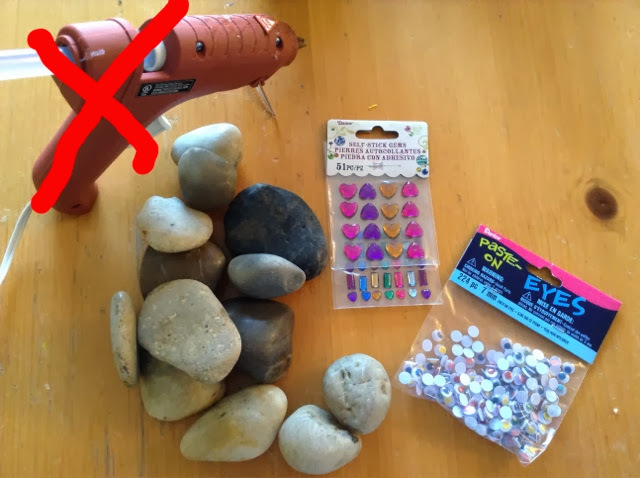 I originally was going to use googly eyes and then use the heart jewel stickers for noses, but when I tried to use the hot glue gun to attach the pieces, they just did not stick. I have no idea why that would be, but I tried several rocks with no more luck. If you missed part 1, you can read it here. When we left off, I had just been laboring through 8 hours of hard contractions every 5 minutes. And then they stopped. I don’t know if maybe in all of my anxiousness and excitement, I’d psyched myself our or what, but I was beyond frustrated. How could this be happening again?? I thought for sure I was going to have a baby this time. I’d done 8 hours already! For what?? For nothing?? It was about 12:30. I texted the doula to let her know it wasn’t happening. We watched a little more tv. I decided to do the dishes that were in the sink. I unloaded the dishwasher. Then I got the laundry out of the dryer to fold and put in another load. “I guess it wasn’t meant to be on the 17th after all,” I told my husband. We ate our leftover pizza from the night before. I was having about one contraction an hour, but that was nothing compared to what I’d had earlier in the day. My good friend’s mom even stopped by for a short visit. About 5:00, I called my mom and told her that it didn’t look like I was going to have the baby after all, so she should keep Little Spaghetti another night. Maybe I’d really go into labor the next day. I was sitting on the couch after I hung up the phone, looking out into the late afternoon sun that was pouring through the open blinds. I wanted to cry. “We need to do this,” I told myself. “It’s just time.” The tv was on in the background, but I wasn’t paying attention. I felt a contraction. I kept going, believing myself more and more each time I said it. “We are strong. We are safe. We can do this.” I felt another contraction. And then another. By almost 6:00, the contractions were feeling pretty regular again. And pretty intense. I decided to get back in the tub because it had been so much easier to deal with the pain. My husband started timing the contractions again. 5 minutes apart. Then 4 and a half. “If they stay under 5 minutes through a few more contractions, we’re going to the hospital,” I said. After 15 minutes or so, I convinced myself that I’d felt my water break. I wasn’t sure, since I was sitting in a tub full of water, of course. “I think we should go,” I told him. I wasn’t 100% sure I was in labor; it felt just as it had that morning, and that obviously hadn’t been it. I just knew that, emotionally, I was done. I couldn’t take any more starting and stopping. I knew if we went to the hospital, I’d have a baby one way or another. I started crying. Sobbing. “Oh, honey. What if I can’t do this?” I said through my tears. “You can. And you will,” he told me. I believed him. We are strong. We are safe. We can do this. We got in the car about 6:45. I texted the doula to let her know. We were checked in at the hospital and up in the room by about 7:30. The nurse came in to get us situated. “Have you thought about what you’d like to do for pain management?” she asked right away. “I want to try to go without any medication,” I told her. “Oh, ok. So just the IV pain meds, then?” she said. “We’ll see about that,” she said. The midwife came in to check me. I was a little terrified I’d still only be dilated a centimeter or two. “You’re at about a five!” she said. That was total relief. She said they’d monitor me for a while, and she wanted to start an IV because I looked dehydrated. I thought it was pretty unnecessary, but I also wanted to pick my battles, so I agreed to the fluids. Then – after a while – she said we could take out the IV, and I could get in the shower if I wanted. “No,” was all I said. Shortly after, I told them I was getting out of the bed. I don’t think they would have let me if I hadn’t insisted, and they definitely wouldn’t have suggested it. I stood by the bed and mostly rocked through the contractions. They were getting more intense and closer together. Even still, between them, I joked and talked with my husband. The spaces between the contractions were such strange times for me. At one point, I was breathing through a contraction, and my hand started to tingle. I was wiggling my fingers, and my arm felt kind of numb. I must have looked at her sort of bewildered. Oh, right, my bad. I’m just trying to give birth! I’ll stop my silly rocking nonsense so your blood pressure cuff doesn’t cut off the circulation to my entire arm. An hour or so later, I had dilated to about a 7. It all seemed to be happening so fast. Mr. Engineer texted my mom (the first she’d heard since the 5:00 we’re-not-having-a-baby-today message). Never mind. It looks like the baby’s coming today after all. We’re at the hospital. At some point, moaning through the contractions started to feel really good. I tried to say “O” sounds because I remembered reading somewhere that keeping your mouth open would help you relax and open the rest of your body. I tried to picture the contractions opening my cervix, and I worked really hard at relaxing my body instead of tensing all of my muscles during each contraction, which is what my body wanted to do. I’d drop my shoulders and force my muscles to release as I breathed. The midwife was concerned that the baby was starting to rotate face up, so she told me I had to get into the bed and lay on my side to encourage her to turn back the other way. This made the contractions almost unbearable. This is also about the time the doula arrived. Lying on my side was nearly impossible. I couldn’t put my upper leg down because…there was a baby’s head in my pelvis. So I was holding my leg way up in the air in a completely ridiculous position. The doula helped gather up five or six pillows to put between my knees to give my leg muscles some much needed rest. At this point, I’d mostly stopped talking, even between contractions. But even then, after the pain would subside, I had a healthy internal dialogue going. I remember making jokes in my head throughout the whole process. And mentally rolling my eyes at the nurse on occasion. I felt a contraction coming on, and just then, I also heard the machine kick on to inflate the blood pressure cuff. I could. not. take it. “Take it off,” I growled. “I’ll get in trouble!” my husband said. I looked right at him. “Take it off,” was all I could say again. And he did. And off it stayed. I looked at my husband, and I looked at the doula. I didn’t know what I wanted to do. It was a little after 9:00, and somehow in my mind, I still had a lot of laboring left. I didn’t want to preclude the option of getting in the shower if I needed to. “Look,” she said, “could you even stand up to get in the shower right now if you wanted to?” I looked down at my legs. They – along with my whole body – were shaking uncontrollably. “If I break your water, you’re just going to have this baby,” she said. I agreed. “If you start feeling pressure like you need to push, let me know,” she said as she left the room. The shaking, I knew, was a sign that I was in transition. But I couldn't possibly actually be in transition yet, could I? The doula was on one side of me, my husband on the other. I moaned louder and louder through the contractions. I heard them telling me it was ok, and I was doing great. We are strong. We are safe. We can do this. I remember thinking to myself after one contraction, “I want to ask for the epidural, but it’s probably too late for that. I don’t want to be that girl. It’ll be ok.” My husband looked at the clock and said, “Well, there’s still two hours of the 17th left.” 10:00. It seemed like the midwife had just left the room, and I felt like I needed to push. It was so strange that the contractions felt different all the sudden. It was like they went from feeling like they were ripping my body apart to feeling like they were crushing my body into itself. I wasn’t sure, though, so I figured I’d wait for one or two more. After two more, I was sure. “I have to push,” I managed to say. Someone went to get the midwife. Sure enough, I was at a ten and ready to have a baby. “Do you want to turn over onto your back?” the midwife asked me. I was still in the ridiculous position with my leg flying in the air. I looked around. I thought about it. I knew I could handle the pain in my current position; I’d been doing it. But I wasn’t sure if the pain would be worse if I moved, so I was afraid to change. “I don’t know,” I said. “Ok, here’s the deal,” my midwife said. “You’re going to turn onto your back, and you’re going to push out this baby.” In that moment, I was really glad she made the choice for me. The time came to push. Pushing wasn’t as easy this time around, but I still didn’t push for more than about 15 minutes. Throughout the entire thing, I remember having conversations with myself inside my head. Finally I felt her head come out. Little Spaghetti had pretty much come out all at once after his head was out. She didn’t. I had to push again to get her shoulders out. I felt them come free and slide out, and I smiled with the anticipation of that huge sense of relief you feel when the baby finally comes out. But I didn’t feel it. “Open your eyes!” the midwife said. “Look down at your baby!” I opened my eyes and looked down at my half-emerged baby, her squished purple face with eyes closed sitting on top of a yellowish torso. In retrospect, if I’d been expecting the question, it might have been a beautiful moment. At the time, though, all I knew was that I’d been expecting a huge wave of relief as the baby popped out, and I wasn’t feeling it. I wanted to feel that relief! It was an incredible and intense birth, but I am so happy for the way it turned out. She was bright-eyed and nursed right away. I remember all of it. Just about three hours after we’d checked into the hospital, we welcomed her into the world. Turns out she was an October 17th baby after all. I can’t believe it’s already been three and a half months, but I’m finally sharing my birth story. It will be ridiculously long…just so you know. The week of my due date, my mom decided to come over to visit. She lives about a four-hour drive away. “If you haven’t had the baby by Wednesday,” she said, “I’ll take Little Spaghetti, and we can go back home and give you guys a day to yourselves.” My heart dropped. That meant he’d be gone Thursday. October 17th. What if the baby really did come that day? He’d miss it. Wait a minute. He’d miss it? Miss what? Watching me be in labor? On second thought, that sounded like a perfect idea. But what if I didn’t spend my last day as a mom of one with him? Well, I’d had three and a half years for it to be just me and him. If I hadn’t made the best of my time with him, one more day wasn’t going to change anything. Later that day, I went to the OB for my 40-week check-up. He said my cervix looked the same as it had for weeks. He stripped my membranes and sent me on my way. That afternoon, my mom and I made "Put You Into Labor Eggplant Parmesan." I’m not sure if eating this lasagna could put you into labor, but I think making it sure could. Tuesday morning, about 3 a.m., the contractions started up again. Every 5-7 minutes. “The lasagna worked! This is going to happen for sure now,” I thought. Three hours later, when my husband got up for work, I told him I thought it might really be happening. I tried to keep busy. I googled “labor starting and stopping?” and ”does labor stop?” and “contractions start and stop, when will I have this baby.” Everything I read told me I was having “false labor.” Let me tell you, folks, that may be what they call it, but this labor was anything but false. Wednesday morning, can you guess what happened? Boom, contractions, every 5 minutes starting at around 3 a.m. And then, after a few hours, they stopped. I was getting really discouraged by this point. My mom took Little Spaghetti home with her later that day, and my husband and I went out for pizza that night. If nothing else, I was going to enjoy my last day to not haul any kids around. Thursday morning, about 4 a.m., the contractions came back. This was old news by this point, so I tried to go back to sleep. My husband woke up with his alarm clock and told me he was going to stay home from work because he was getting a cold. We both went back to bed, and I think I dozed on and off. A few hours later, the contractions weren’t stopping, and it was getting harder and harder to lie down through them. I got up to move and walk. Or sit on the yoga ball. Or something. Some positions helped the pain; others made it much worse. I’d get myself in a position and be afraid to move in case I got caught somewhere that made me much more uncomfortable. When I did, I’d just buckle down and breathe through my contraction until it was over and I could get into a position I knew would hurt less. About 8:00 or so that morning, I decided to get in the bathtub. That felt so much better. The contractions were still intense and still coming every five minutes or so. That was the strangest time, for me. I’d be in incredibly intense pain for thirty seconds or so. Rocking in the water and moaning through the pain. And then it would just be gone. And I’d feel totally normal for another four minutes or so until the pain came back. During those in-between times, we’d laugh and joke about things. My husband had brought a laptop into the bathroom so we could watch TV. We were blowing through the whole season of Master Chef Junior. I felt hungry after a couple hours and decided that Jello was the only thing that sounded good. “I’ll go get a couple boxes,” Mr. Engineer said. “Boxes? ?” I said, “Who are you kidding? What are we gonna do – boil water and wait for it to set up in the fridge? I think we’ll have a baby before it’d be ready to eat.” Pre-made Jello from the dairy case it was. Red and orange. They both tasted phenomenal. About noon, I was really starting to feel like we might want to head to the hospital. I was getting anxious and excited that we were finally going to meet our little girl. My mind started racing, thinking of the things we should gather up and get in the car. Eight hours of contractions every five minutes seemed like it had to be going in the right direction. I decided to get out of the tub and walk around to see if I could move things along. I texted my doula to let her know that I thought I might be getting close, as she had a two-hour drive ahead of her to get to me. I went out to the living room to sit on the exercise ball. The contractions didn’t seem to be coming as often. I started timing them again. 7 minutes apart. Then 8. Then 9. Tomorrow: birth story, part 2! So, it's almost Valentine's Day. I never cared too much about Valentine's Day. I mean, it's nice to celebrate those you love. And it's nice to get a sweet surprise. But it's never been one of my favorite holidays or anything. Until last year when I realized just how much fun it is to make your little boy give valentines to grown women. Actually, there was very little making involved; Little Spaghetti was super into it. I think he had a lot of fun with it. It seemed to totally make people's day, too. You should have seen him melt all those ladies' hearts. Except the one librarian to whom he said, "No! There are none of these for you!" while he handed them out to every other librarian. Thankfully, he reconsidered about thirty seconds later and gave her one after all. My favorite part is when we go visit people on our weekly outings, and there are a couple of them that still have his valentines hanging up by their desks almost a year later. Which is also, sadly, when I'm finally getting around to blogging about them. But...Valentine's Day is coming up again, so I figured I might as well share our cute little fuzzy valentine guys from last year. Aren't they cute? And fuzzy? It's pretty much just a yarn pom pom (see this page for a tutorial on making yarn pom poms if you don't know how). Then I glued on a foam heart at the bottom for feet, some googly eyes, and the antennae, which are just little pipe cleaners with glittery foam hearts. Little Spaghetti had so much fun helping me make them that he asks me to make them on at least a monthly basis. We have a lot of warm fuzzies around our house these days. I used some double sided tape to stick the little guys (or gals?) 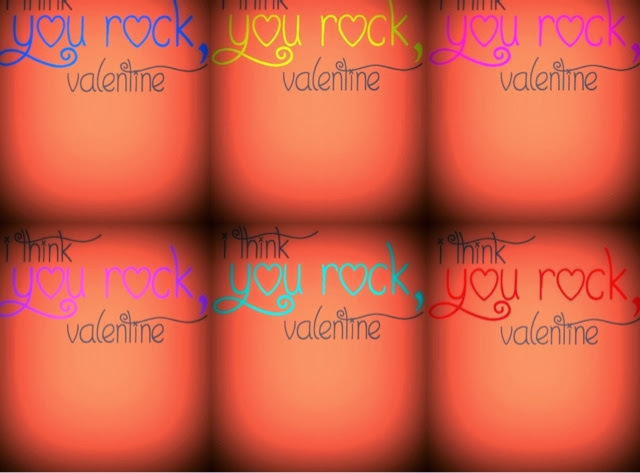 to the valentines...which I'm posting here as a free printable so you can make your own if you feel so inclined. Easy, cheap, and cute; that's my kind of project.